Reading is at the heart of learning, from pre-K to graduation. TeachersFirst offers these resources to support reading across the curriculum PreK-12 and encourage independent reading through school and in cooperation with parents. TeachersFirst offers several resources and special collections to promote reading as part of any subject or grade, even with high school students. Audio Books Resources: These educator-reviewed resources from TeachersFirst offer audio books so all students, including emerging readers and ESL/ELL learners, can experience literature and other reading selections in audio form to reinforce and inspire literacy skills and enjoyment. Also find TeachersFirst's specialized collections of audio books with accompanying text or audio books with interactive features. CurriConnects: TeachersFirst's own curriculum-connected booklists for specific curriculum topics and subjects. These lists include Lexile® levels, ESL levels, and links to author web sites. 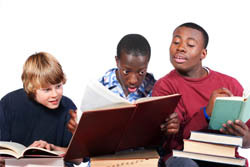 Assign books in literature circles, as part of a teaching unit, or as independent reading so student connect newly-gained knowledge to what they are reading and vice versa. Graphic Organizers: Explore resources to make and use graphic organizers as an effective tool to improve comprehension. See suggestions for ways to use graphic organizers with specific reviewed resources as part of a lesson or unit. Reading in the Content Areas: Explore resources that support instruction on reading comprehension, vocabulary, and content area reading, even with older students. Study Skills: Help students master vocabulary, organize their studying, and much more using these reviewed study skill resources. Make them partners in learning how to learn. 100 Best Books: TeachersFirst offers a listing of 100 of the best books for children, originally from a poll of teachers done by NEA. The list includes links to reviewed resources about some of the books. CurriConnects: TeachersFirst's own curriculum-connected booklists for specific curriculum topics and subjects. These lists include Lexile® levels, ESL levels, and links to author web sites. Share books in literature circles, assign them as part of a teaching unit, or suggest them as independent reading so students connect newly-gained knowledge to what they are reading and vice versa. What should every literate student (or adult) read? Here are some suggestions from our editors. More Reading Lists: Find booklists for dozens of topics. Use a specialty list to support a social studies or science unit or just to focus on a theme for the month in your classroom. TeachersFirst's Special Topic Reading Lists: See suggestions to fit a wide variety of interests typical in middle and high school students. TeachersFirst’s Suggested Reading: Let students create their own adventures. Our teacher-editors have selected titles with continuing appeal, whether for school or recreation. Find books by grade level and share this resource with students and parents, as well. TogetheRead: Share family reading and activities around a monthly theme using this outstanding series. Interwoven into each TogetheRead theme are questions and activities based on reading strategies for effective readers. Parents and children of all ages can select books from the annotated lists, read together, and do related free or low-cost activities. Books are grouped into age "bands”: preschool/picture books, early elementary, upper elementary to middle school, upper middle school to young adult, and mature teen to adult books. Everyone can read about the same “theme” and enjoy the activities together.